IT’S FINALLY SUMMER – LET’S GO! In the mid-west, winter finally let go of her death grip on the weather forecast. If we understand our boat and RV-owner customers like we think we do, those few weeks have been plenty of time to get out and enjoy their homes-away-from home. We also understand that, just like with traditional, stationary homes, boats and RVs almost always have a “project” that needs working on. If that project happens to be hanging curtains, let us help. Given the size and variability of features available on boats and RVs, it is almost impossible to buy premade curtains that fit properly. Custom made curtains, and tracks like the CurtainMate, make decorating much easier. 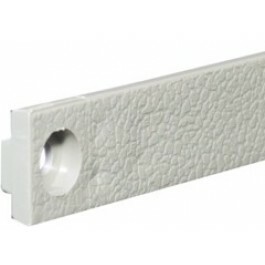 The CurtainMate is a wall-mounted track that comes in three-foot sections with overlapping ends that allow sections to be joined together as needed. It’s small, inconspicuous profile works well in boats and RVs in which space is at a minimum, and you want to see your curtains, not your track. This track can be bent by hand vertically and horizontally to fit into almost any space, and is a favorite of do-it-yourselfers due to its ease of installation. We’ve got seven colors to match your décor, and all the drapery hardware you need, ready to ship. We want you to have the right curtain track and the right curtain for your boat and RV needs. We offer many custom features and services to help you get it just right, and we can make curtain panels to fit any space in your boat or RV. We have great fabrics like the Eclipse light blocking and sound absorbing panels, which are a favorite on boats, RVs, and busses; and our Shadow Cube stain and odor-releasing privacy panels. Save yourself a trip to the dealer and call us to talk tracks, curtains, and replacement drapery hardware. Chances are we have exactly what you need.